Basmati rice, a long-grain cultivar from India known for its fragrance and subtle flavor, has been discovered in recent years by American chefs. Photo by Brandon W. Mosley | SXC. CAPSULE REPORT: Learn all about rice, how it is cultivated and the many different types of rice in this comprehensive review. Click on the black links below to visit other pages of the article. There is a story that cultivation of rice in America began by accident in 1685, after a storm-damaged ship from Madagascar docked in the harbor of Charleston, South Carolina. The captain of the ship gave a small bag of “Golden Seede Rice,” (named for its color) as a gift to a local planter. While that may be so, it was not likely to be the first appearance of rice in the New World. 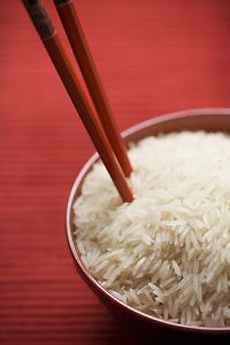 Colonists from Europe had also brought rice with them in the 1600s. By 1726, Charleston was exporting more than 4,000 tons of rice a year, and “Carolina Golde” later became the standard of high-quality rice throughout the world. When America gained independence 50 years later, rice was one of the major agricultural crops. The U.S. has historically exported more rice than it consumed. From the 18th century until the beginning of the Civil War, rice was a major crop of the Carolinas and Georgia. It is a very labor-intensive crop, but wealthy rice plantations had hundreds of slaves, and from 100 to 300 were required, depending on the size of the plantation. Familiar with African rice cultivation, the slaves are credited with contributing significantly to the area’s industry before it was destroyed by the Civil War. Following the war, and with the mechanization of agriculture, rice growing moved west to Louisiana, Arkansas, Louisiana, Mississippi, Missouri and Texas. The 1849 gold rush brought many immigrants to California, including an estimated 40,000 Chinese, whose staple food was rice. Rice production became a necessity. Fortunately, it grew well in California’s Sacramento Valley, in clay soil that was largely unsuited to other crops. Today, California is America’s second-largest rice producer, after Arkansas, the twelfth largest rice producer worldwide and the second largest exporter of rice (the first is Thailand). While the U.S. is a major exporter, we keep about half of our rice for domestic use. According to the USA Rice Federation, 90% of the rice consumed in America is grown here. Now that you know the history of rice, see how it is grown.